A half century after he developed it, Gordon Tullock’s idea of rent seeking is more relevant than ever. Though the concept has gained widespread acceptance among academics, it has yet to make an impression on public discourse. But with favoritism, corruption, and the power of special interests in the headlines, the idea deserves broader attention. 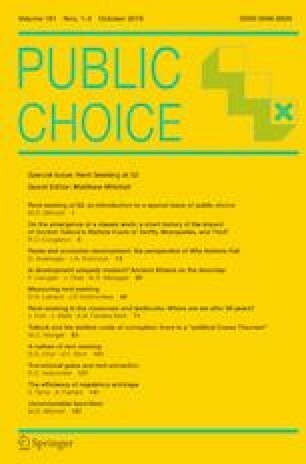 In this special issue of Public Choice we commemorate Tullock’s insight. Contributors examine the making of this classic piece and its effect on economic theory, empirical analysis, and economic teaching. Original papers also develop new insights into questions of development, the control of violence, corruption, culture, equity, regulation, rent extraction, the Political Coase Theorem, and more. In the Bizarro World of DC Comics, up is down, black is white, and nothing is as expected. The same could be said of a rent-seeking market. When either economic surplus or real resources can be transferred involuntarily, individuals and groups who might be favored or disfavored have an incentive to expend effort seeking or opposing those transfers. Such efforts often are socially wasteful and ought to be considered alongside other costs of transfers such as deadweight losses. That is the central insight of Gordon Tullock’s (1967) seminal paper, “The welfare costs of tariffs, monopolies, and theft”. We celebrate his insight in this special issue of the journal Tullock founded. Tullock’s idea was eventually dubbed “rent seeking” (Krueger 1974). And in the bizarre world of a rent-seeking market many of the normal rules of economics are turned on their head. More competition results in less efficiency (Tullock 1980). Political agents profit by doing nothing (McChesney 1987, 1997). Entrepreneurial activity hampers growth (Baumol 1990; Murphy et al. 1991, 1993). And in the end, even those who are privileged often fail to reap above-normal returns to their investments (Tullock 1975). In the following pages, public choice scholars explore and extend the important and often-unexpected implications of Tullock’s bizarre idea. Congleton (2018) kicks off this special issue by noting that despite its academic success, Tullock’s idea had a inauspicious beginning. Tullock’s article initially was rejected at several journals before it was finally accepted by the then rather obscure Western Economic Journal (now Economic Inquiry). It largely was ignored for several years. It is telling that when Anne Krueger independently developed the idea, she was unaware of Tullock’s article. But over the next few decades, as Tullock and others expanded on the concept—a particularly important step was the publication of an edited volume on rent seeking organized by Robert Tollison (Buchanan et al. 1980), in which Tullock’s “Welfare Cost” paper was reprinted—the 1967 article came to be regarded as a classic. In James Robinson and Daron Acemoglu’s article, the authors of the acclaimed book explaining why some nations fail while others prosper (Acemoglu and Robinson 2012), place Gordon Tullock’s seminal insight at the center of their story. Robinson and Acemoglu (2019) argue that “rent seeking, in the guise of ‘extractive institutions,’ provides the dominant explanation for patterns of comparative development.” In their account, as well as in that of Carugati et al. (2019), the real mystery is not the existence of rent seeking, but the way in which a few fortunate societies manage to break free of it. For Robinson and Acemoglu, it is those rare societies with inclusive political institutions that tend to have inclusive rather than extractive economic institutions and therefore break free of the poverty trap. Hall et al. (2018) survey the ways in which academic economists have—or have not—taken on their collective responsibility. They examine classroom experiments in rent seeking, provide popular culture examples of rent seeking for relevant undergraduate courses, and survey both undergraduate and graduate textbooks. They find that a majority of undergraduate texts cover rent seeking, while no graduate textbook in their survey does. Many scholars regard moderate corruption as a short-term Coasean work-around that greases the squeaky wheels of governance in underdeveloped countries. Munger (2018) draws on underappreciated work by Tullock (1996) to make the case that corruption is, in fact, “neither efficient nor irrational.” Over time, moderate corruption ossifies into rigid and serious corruption, highly—even violently—resistant to change. Choi and Storr (2018) sketch, for the first time, the characteristics of a culture of rent seeking. A culture of rent seeking is distinct from both formal and informal institutions that also shape the extent to which favor-seeking is both observed and undermines economic prosperity. It is “a perception shared by members of a society that having influence over political allocations is an important and potentially preferable source of private benefit.” Choi and Storr then go on to list seven characteristics of a rent seeking culture. In his contribution, Holcombe (2018) combines two important extensions of the rent seeking literature—rent extraction (McChesney 1987, 1997) and the transitional gains trap (Tullock 1975)—to argue that policy makers may purposefully design privileges to be short-lived in order to extract more wealth from the private sector over time. Tarko and Farrant (2019) examine rent seeking in the context of polycentric governance. More realistic than monopolistic theories of governance, polycentric governance is in some ways more likely to lead to better outcomes than those suggested by theories grounded in governmental coercion. But Tarko and Farrant caution that the most optimistic views of polycentric governance are likewise also unrealistic. Finally, in my own piece (Mitchell 2018), I examine uncontestable favoritism. While much of the rent seeking literature has focused on rent-seeking contests, institutional rules and cultural norms often ensure that governmental favor or disfavor is uncontestable. Uncontestable favoritism is efficient along some dimensions. But it is grossly inequitable. Understanding that fact helps to understand the persistence of inequitable social arrangements and helps to highlight some of the economic and philosophical tradeoffs in such arrangements. By almost any measure, Tullock’s rent-seeking insight represented one of the 20th century’s most important theoretical advances in economics. A Google Scholar search of the term “rent seeking” turns up some 190,000 results; Arrow et al. (2011) list the article in which Krueger (1974) coined the term among the top-20 most influential papers in the American Economic Review. The concept has had a profound effect on economics and on fields beyond it. Targeted economic development incentives granted to firms like Carrier, Foxconn and Amazon have grabbed headlines in recent months, making it clear that rent seeking is as relevant as ever. The articles in this issue demonstrate that the idea is central to an understanding of development traps, to the successful control of violence, to corruption, and to inequity. Rent seeking, and its often-bizarre implications will no doubt continue to fertilize new lines of inquiry over the next half century. I am grateful to William Shughart for indulging me with this special issue and for helping me execute it. I am grateful to the many contributors whose excellent pieces made it possible. And I am grateful to my late teacher, Gordon Tullock, for sparking a life-long interest in his bizarre idea.